As our bus enters Badami town, the first thing that strikes me is the similarity this place has with Sedona town in the Arizona state of US, with it's huge, red coloured rocky mountains standing next to the town. Badami also has very similar looking red mountains, almost in the middle of the town. Yet there is a difference. The Sedona rocks just stand there. At the most, few rock climbers are seen around engrossed in their hobby. 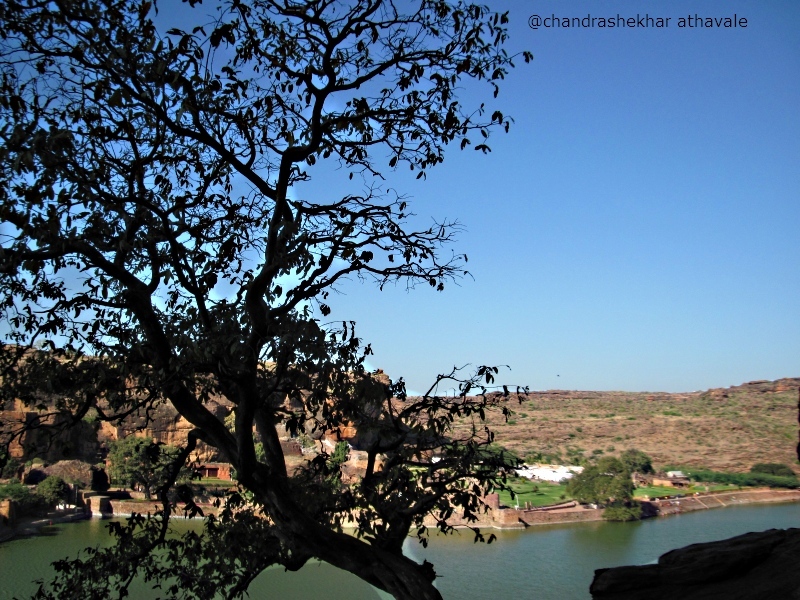 In Badami, things are quite different. 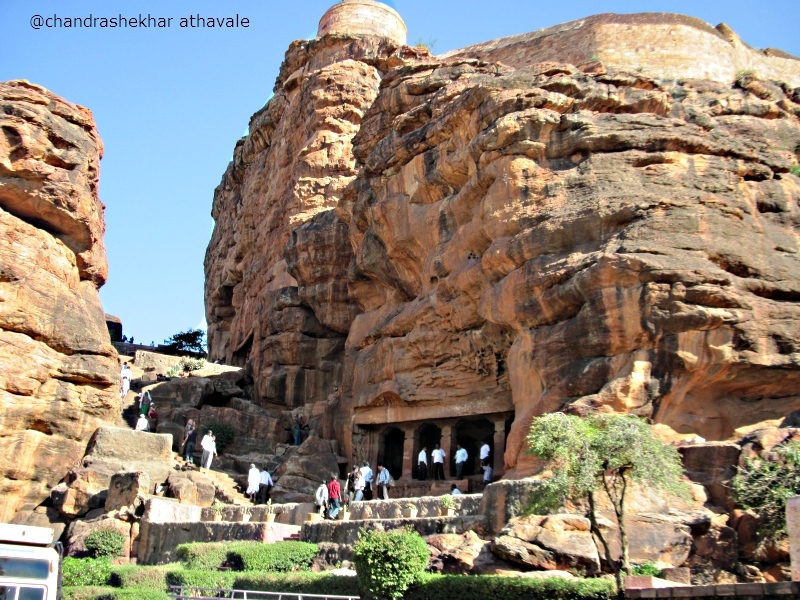 After Chalukya king Pulkeshi the first, had shifted his capital to Badami in the sixth century, successive generations of kings, facilitated excavations of fabulous rock cut temples in the mountains. 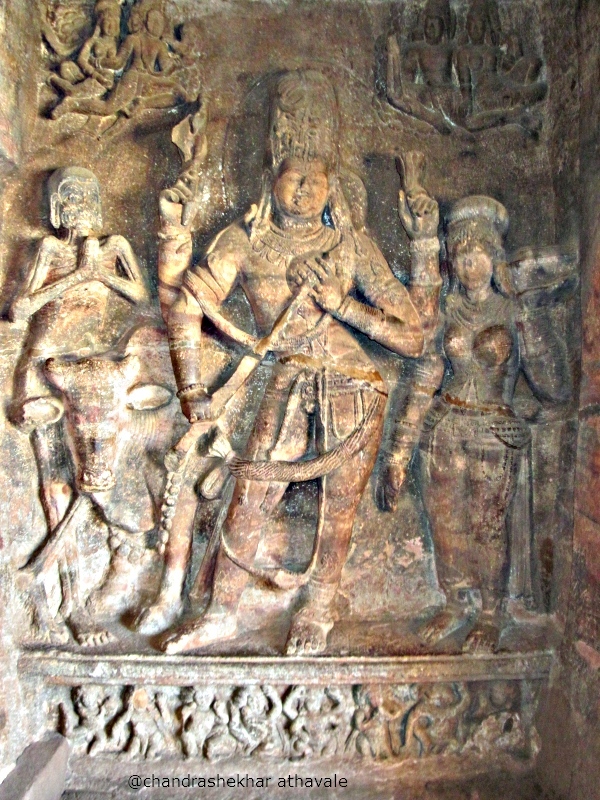 These rock cut temples have some of the most wonderful low and high relief sculptures inside them. 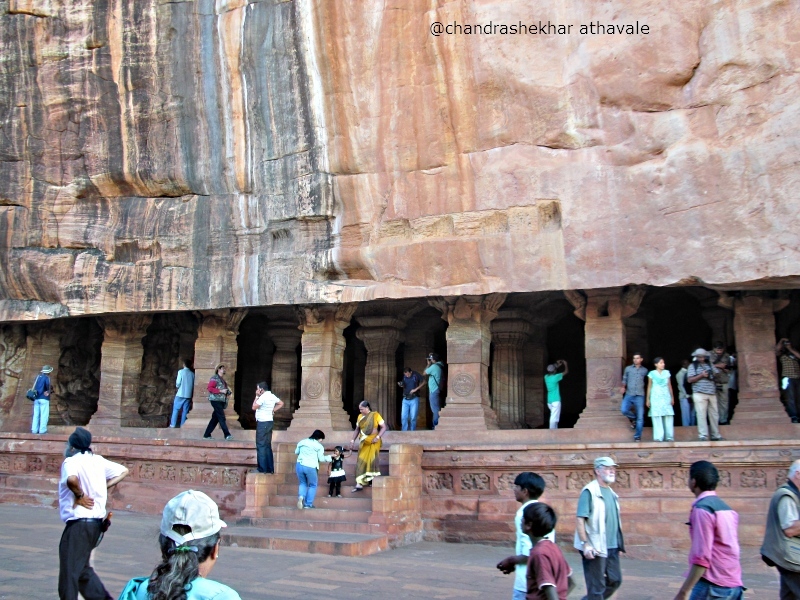 This has made the Badami mountains a frequently visited tourist place. The first thing that I must do now is to have lunch as I am quite hungry. For last several days I have been eating food, cooked in south Indian style. Not that I have any complaints about it, today I would prefer food that tastes different. More like north Indian food. Badami has several eateries that serve north Indian food. I indulge in one of these and then relax in an easy-chair. I have time on my side because climbing up to Badami caves is not exactly a good idea in mid noon. Historically, Badami was known as “Vatapi.” It must have changed to Badami, probably even before Chalukya dynasty time because Greek historian Ptolemy mentions about it in his book written in 150 CE. Even in Ptolemy's times, this town was known as a premier trade centre. The tradition continues and even now this town is a Taluka place and a trading centre. 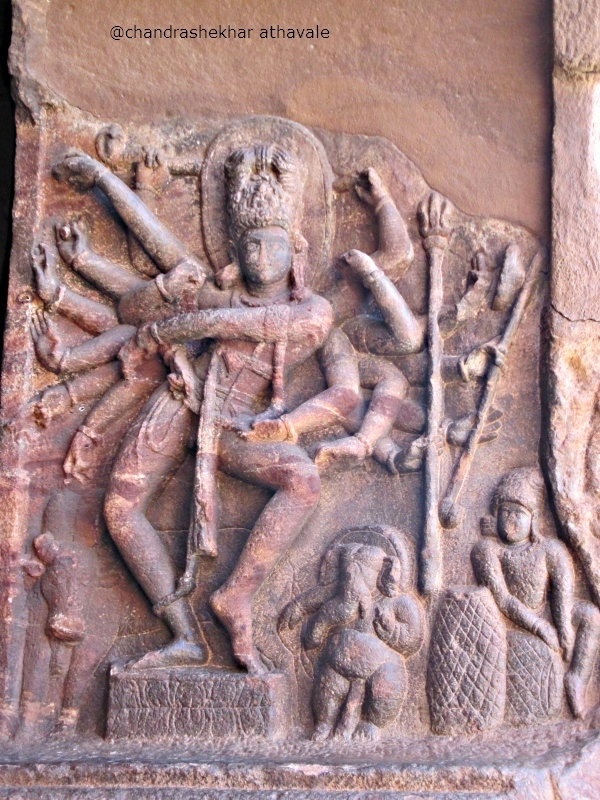 In Chalukya dynasty time, Badami had great political and cultural importance as capital of the empire. During reign of king Pulakesi II, famous Chinese monk Xuen Zang had visited the Chalukya controlled part of India, which he calls as Maharashtra. 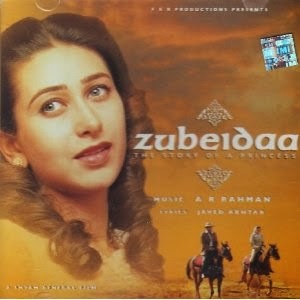 Xuel Zang mentions about the capital city of Maharashtra in his travelogue. However that place, from his description, is definitely not Badami. 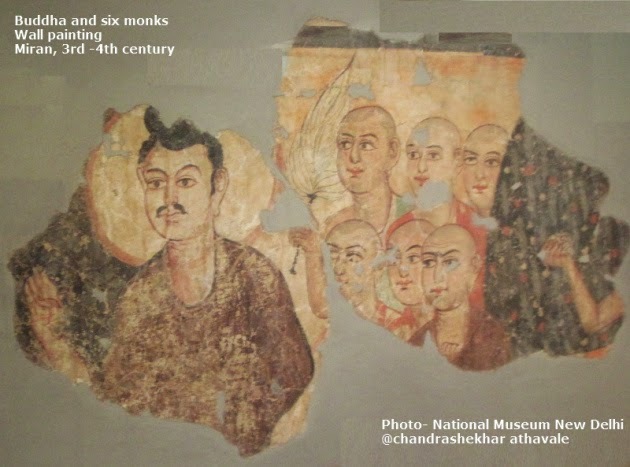 It is possible that Xuen Zang visited some other city (Like Nashik), which might have been made the temporary capital. 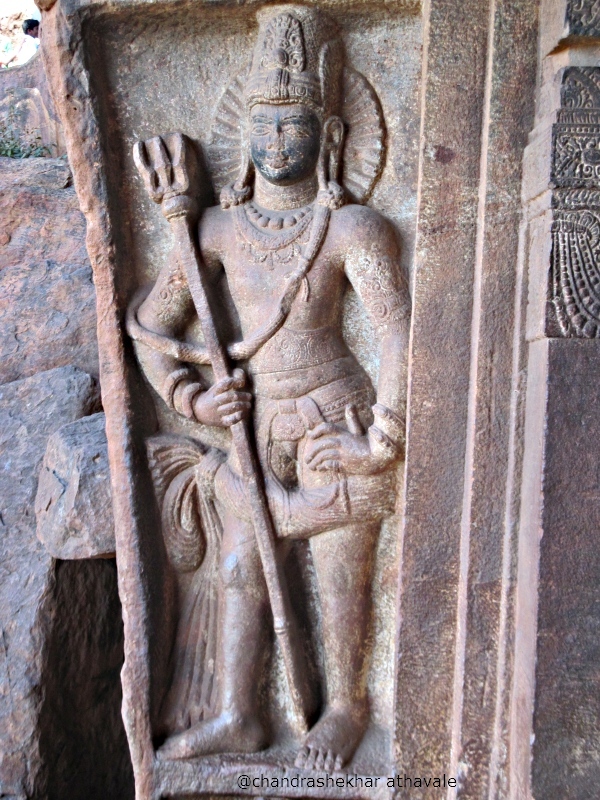 Badami however always remained as the formal capital of Chalukyas. Later in Eighteenth century, then Sultan of Deccan, Tipoo, had build a fort on Badami mountain to protect the town from Marathas' ruling from Pune under reign of Peshavas'. Tipoo Sultan had built along with the fort a treasury also on the nearby mountain. The ruins of both these can be seen here. Our bus is now taking us to Badami caves and can drop us at the foot of the mountain. I look at the watch. Time is about 4 P.M. I can see clearly the Badami mountain and the fort on the top. Archeological department has put up a barricade and gate at the base of the mountain. I buy the entry ticket and enter through the gate. The lowest cave is only about 10 or15 feet from the ground level. There are about 30 or 35 steps that lead me to the first cave known as “Shaiva Gumfa” or cave of Shiva followers. The steps have nice flower beds on either side with patches of green lawns right up to the mouth of the cave. 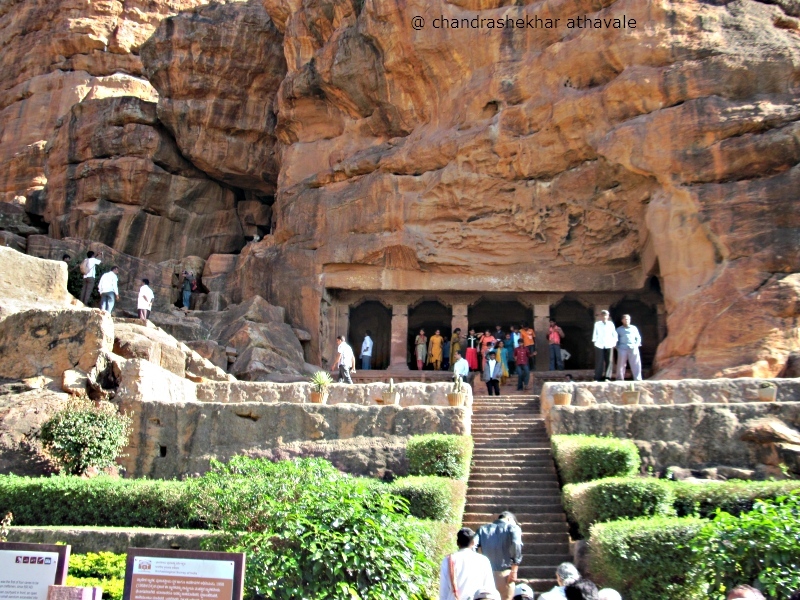 All Badami caves have a similar type of construction. There is a foreground created by flattening the rocks near the mouth of each cave. After climbing about 5 to 7 steps from the foreground, there is a veranda, which is known as “Mukha Mandapa” or Hall at the mouth, with pillars to support the roof. 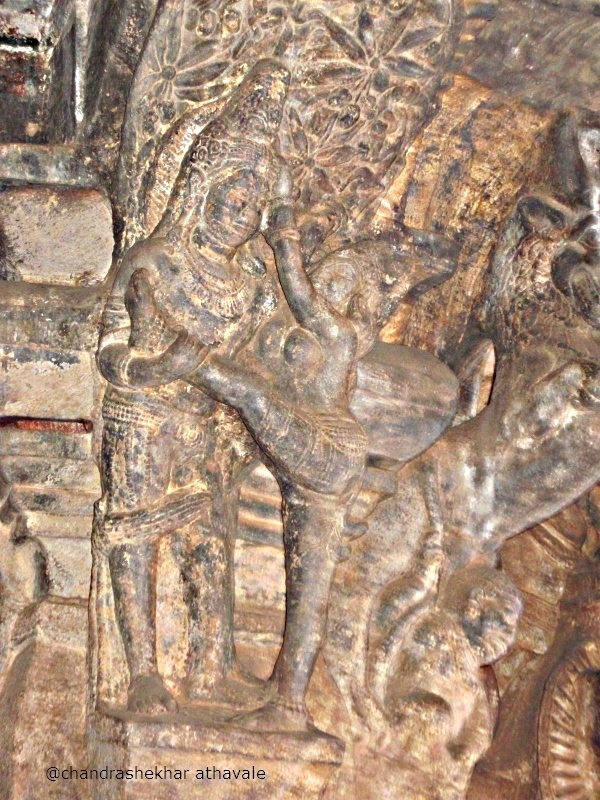 The inner and side walls of this hall at the mouth, have almost life size high relief structures. The entry to the “Sabha mandapa” or Assembly hall is through doors provided in the inner hall of the veranda. This hall also has supporting pillars to support the roof. There are no sculptures engraved on the walls of assembly hall. However just near the roof, where supporting pillars touch the roof, support brackets are usually provided on all four sides of the pillar. 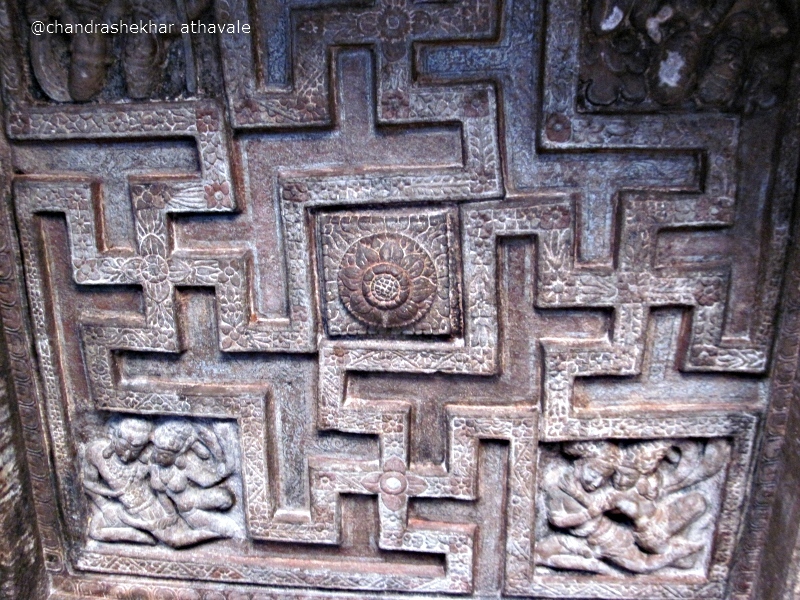 On all these brackets there are many low or high relief sculptures. Behind the assembly hall is a smaller room or sanctum. Usually, only presiding deity of the cave, can be found here. 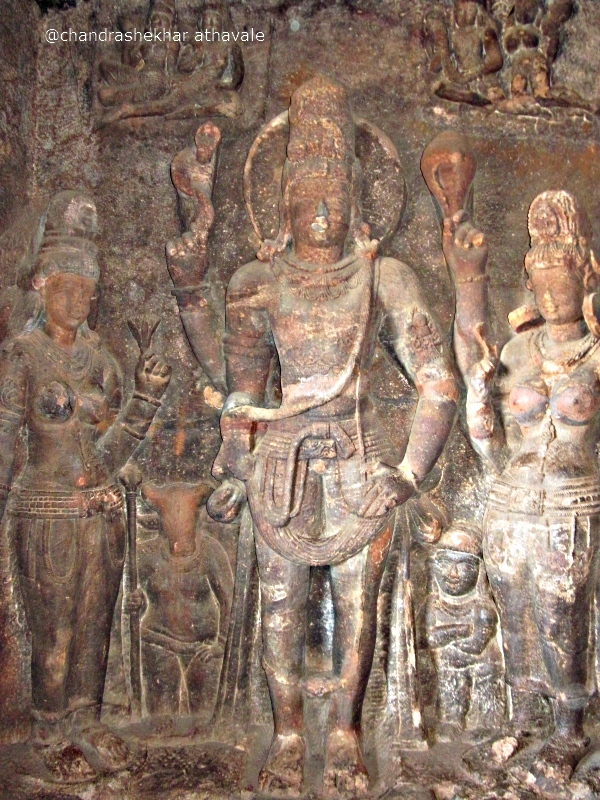 No other sculptures are seen in the sanctum. 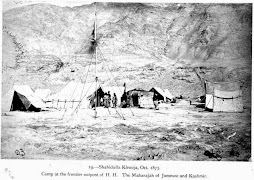 The first Shiva cave was excavated during the reign of King Pulakesi the first, in 543 CE. I am now entering the hall of the mouth after climbing few steps. 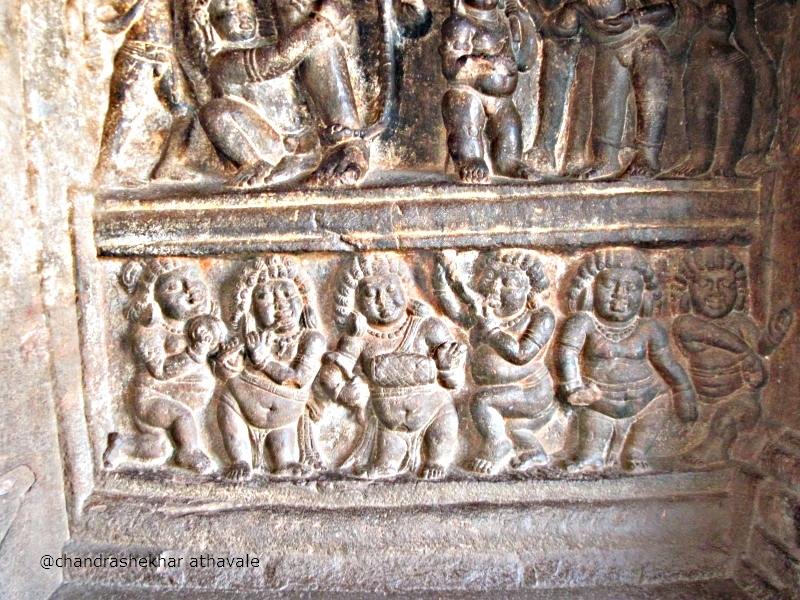 On my right there is a high relief of the dancing Shiva or “Nataraja,” with 9 pairs of hands. If we blank out 8 pairs of hands, the remaining pair shown a dancing position. In other words, this Dansing Shiva, shows us in all 81 dancing positions. 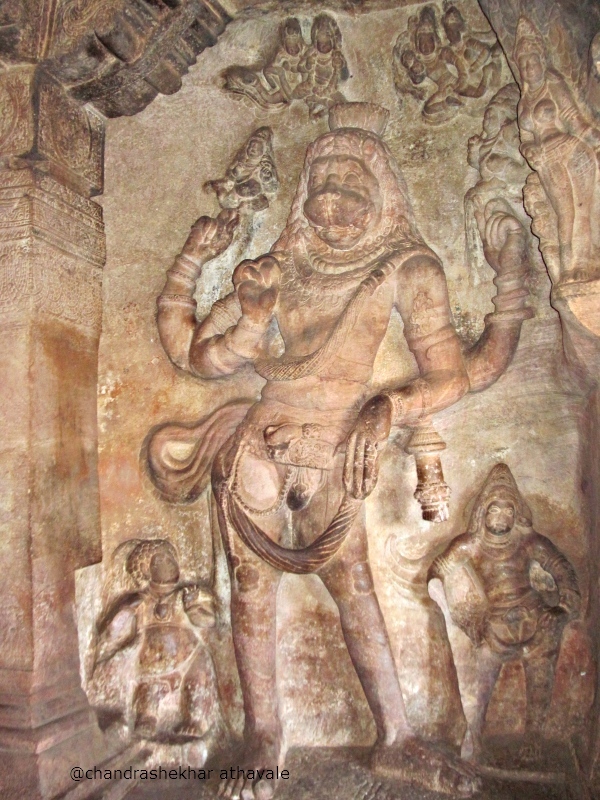 Directly opposite to this dancing Shiva there is a high relief of a doorkeeper with a triple pointed spear or “Trishul.” On the inner wall. 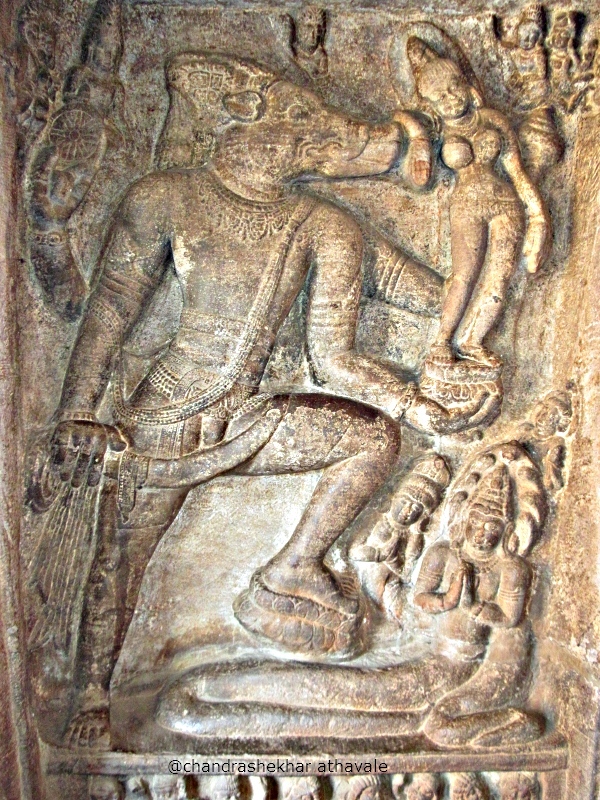 There is a high relief of the Goddess Durga trying to kill the demon “Mahishasur,” who has taken the form of a Buffalo calf. 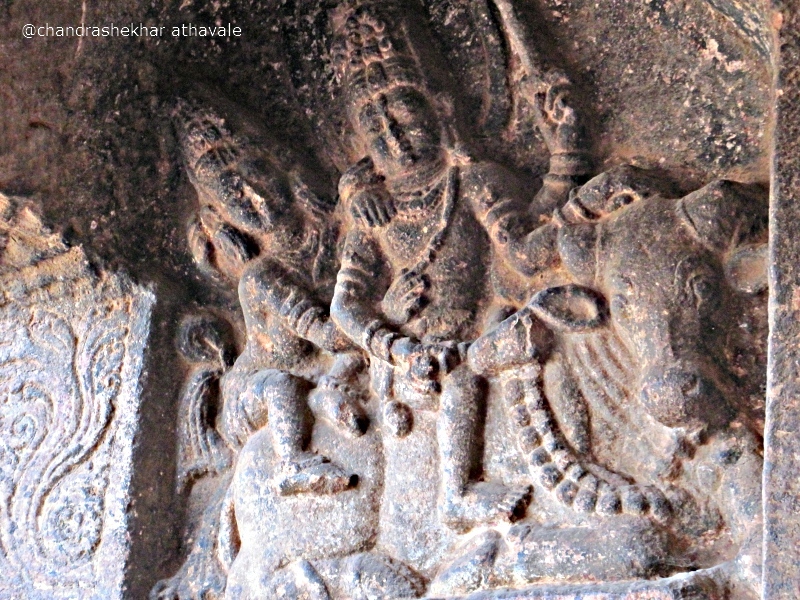 Next to it is Shiva again in form of half man-half woman creature called as “Ardha Nari Nateshwar.” In this sculpture, half man part is Shiva and half woman part is his wife, “Parvati.” Next to it is a similar high relief, which shows half Shiva and half Vishnu, known as “Hari Hara.” In an adjacent sculpture, Shiva is riding a bull and his wife is shown riding pillion with both her legs on one side; very similar to the way modern women wearing skirts or sarees ride a scooter or a motor bike. I enter the assembly hall. It is quite dark inside, but there is not much to see here. I have a casual look at the sanctum an come out of the cave and again start climbing the main flight of steps. The next cave is about 60 steps from the first cave. 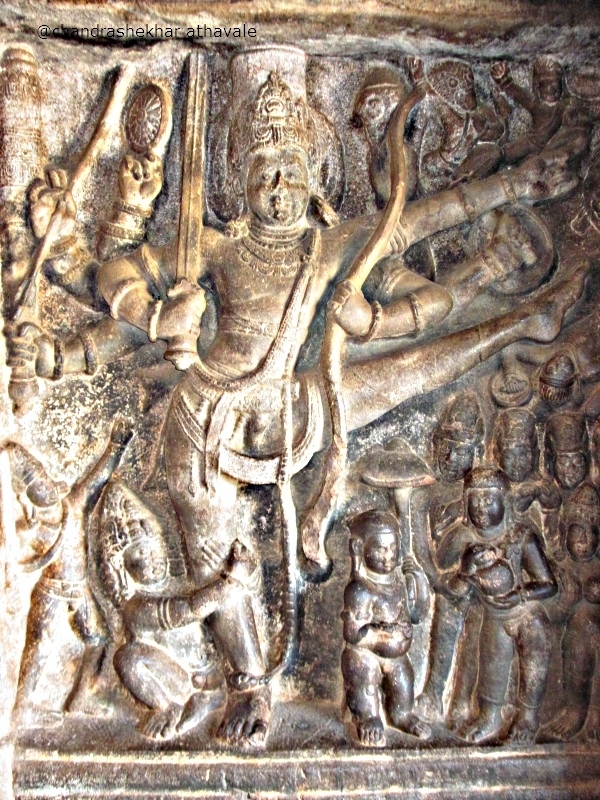 This second cave is known as “Vishnu Gumfa” or Cave of the Vishnu. There are two important sculptures in this cave. The first one describes the story of God Vishnu having taken the form of a swine to free Goddess earth. 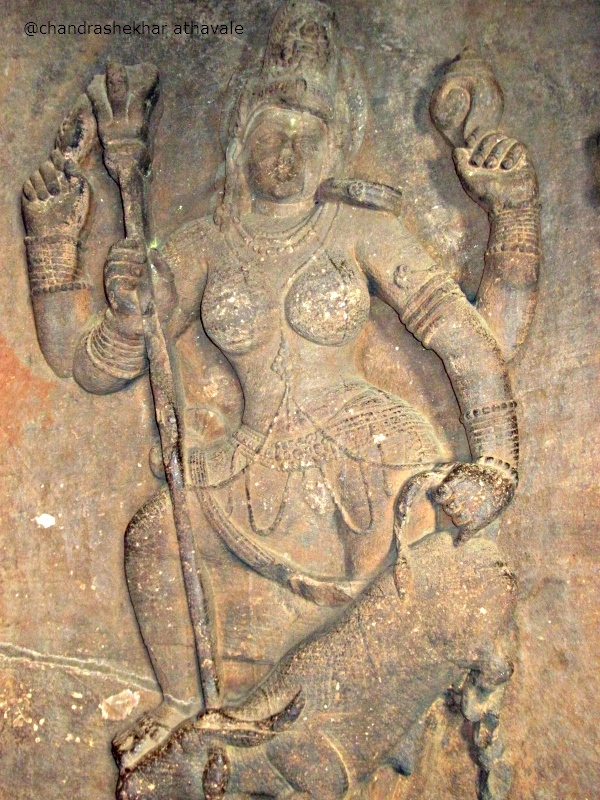 The Goddess is shown here standing on a lotus and supports herself with her left hand kept on the head of the swine. In the next sculpture, the God Vishnu is shown in the form of a dwarf Bramhin known as “Wamana.” He is shown capturing all three entities of “Swarga, Patala, and Bhooloka” or Heaven, Hell and earth from a king known as “Bali.” There is an interesting bass relief on the pedestal here. There are several figures playing musical instruments. The hair style however is shown as curly often seen in Greek sculptures. After climbing another set of 60 or 65 steps, I reach the third cave known as “mahaVishnu Gumfa,” or cave of the God “mahaVishnu.” This cave was excavated in memory of Chalukya king “Kirteevarma” by his brother “Mangalesh.” in the year 598CE. 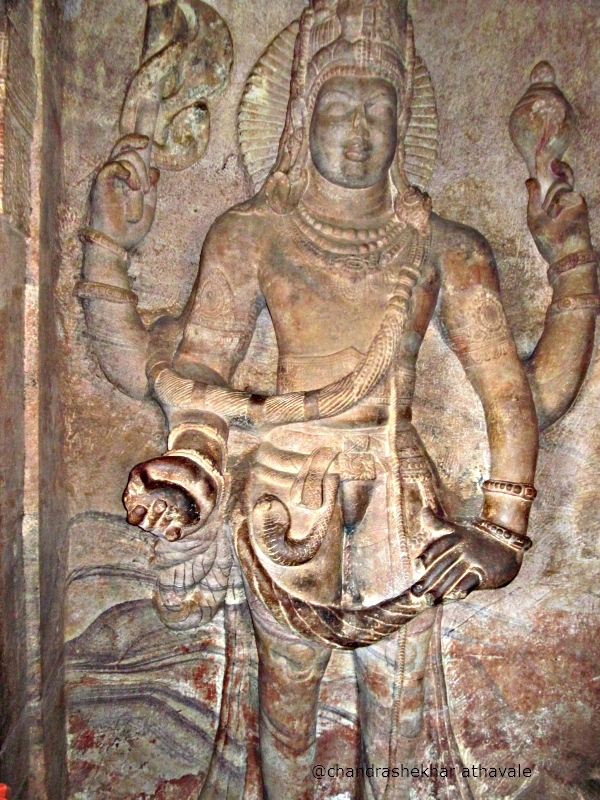 The main sculptures here describe God “mahaVishnu,” Half Shiva-Half Vishnu figure similar to the sculpture in the first cave and Vishnu in form of a man with Lion head, killing demon “Hiranyakashyapu” and roaring like a lion. Another set of 30 steps and I reach the fourth cave. This for a change, is dedicated to Jaina religion and prophet Mahaveer. 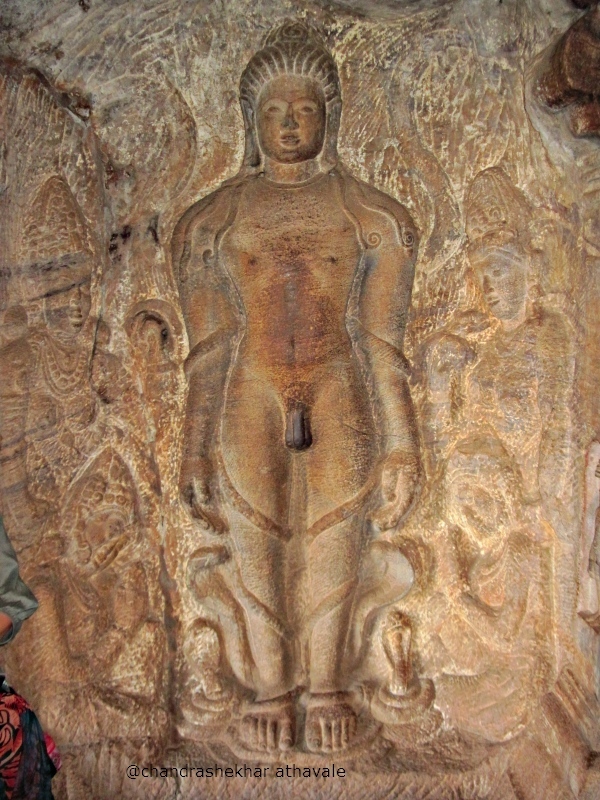 There are some nice sculptures here of Jain ascetics like “Parshavanatha, Gomateshwara and Bahubali.” I come out of the cave and stand near the wall facing the steep cliff sloping downwards. 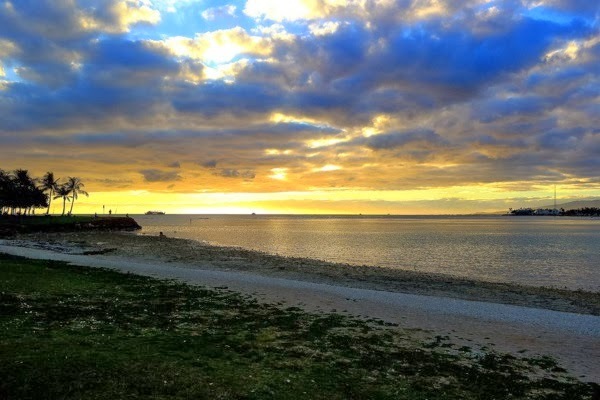 The weather is pleasing, a light cool breeze is blowing and the scene in front of me looks stunningly beautiful and picturesque. There is a lake opposite me, deep down. 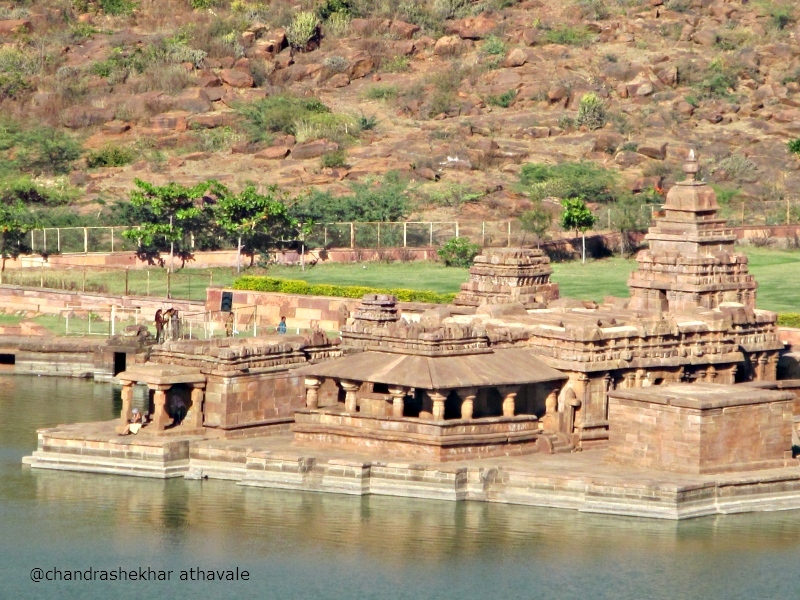 This is known as “Agasti Teerth.” A nice looking temple on lake side is known as “Bhootnath Mandir.” This part of Badami is so beautiful that it is no wonder that Chalukya kings chose this place as their capital. I have now covered almost all of the important places, which are connected with Chalukya history. The time has come to return home. 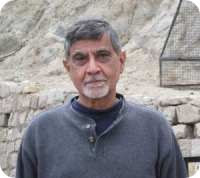 However one more important place, worth a visit and connected with the history of Deccan remains to be seen. 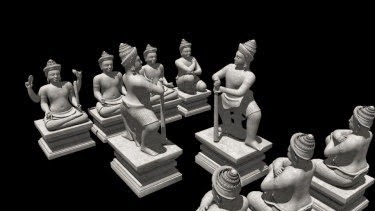 I need to cross again a period of eight hundred years to sixteenth century, when Hampi empire was getting destroyed. However all that would be for tomorrow. 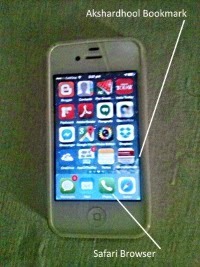 I realize that I am extremely tired and need to hit the bead as early as possible.